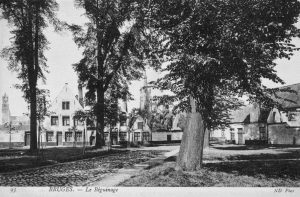 We invite contributions to a study day intending to examine how and why, over the course of the long 19th century, a variety of actors ranging from tourists over writers to artists and historians, explored the nascent architectural and artistic patrimony of Belgium. This process occurred at the very time a patrimony was established by such diverse forces as emerging tourism, the historical endeavours of learned societies and academia, the imagination of literary authors, official heritage policies, and the building of (subsequent) new nations (the Austrian Netherlands were annexed in 1795 to the French Republic, and became part of the (United) Kingdom of the Netherlands in 1815, until in 1830 an independent Belgian state was declared). More in particular, we are interested in how different printed media – from travel guides and travel literature to albums and illustrated newspapers – contributed to inventorying, debating, broadcasting, promoting, and ultimately constructing this patrimony in a national and international context, in word and image. How did the printed medialisation of a nascent architectural and artistic patrimony affect historical artefacts and the ways in which they were preserved, transformed, collected, viewed and experienced? We also hope to clarify how in printed media ‘Belgium’ operated as a notion that invited reflection on art and architecture from outsiders looking in – such as the numerous French authors who visited Belgium in the 19th century, Hugo and Baudelaire chief amongst them – and from insiders, ‘Belgians’, addressing their fellow country(wo)men or looking outward and defining the significance of a national patrimony in an international context. We invite 500 word proposals for 25 minute presentations at a study day jointly organized by the Department of Architecture and Urban Planning of Ghent University and the Chair of the History and Theory of Architecture of the ETH Zürich, and sponsored by Printing the Past. Architecture, Print Culture, and Uses of the Past in Modern Europe (PriArc), an international, multidisciplinary research project funded by the Humanities in the European Research Area Program (HERA). Proposals should be sent to ben.vandenput@ugent.be and nikolaos.magouliotis@gta.arch.ethz.ch by June 15th, 2018. Notification of acceptance will follow by June 25th.